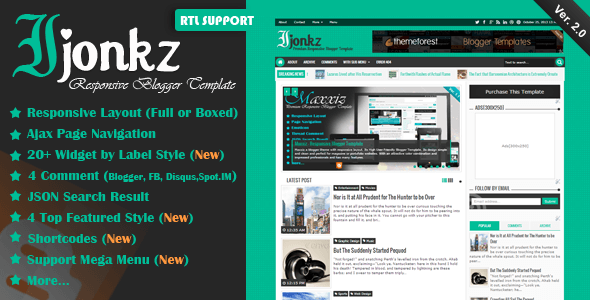 Ijonkz Responsive Blogger Template is a premium blogspot theme that comes with responsive layout and two view styles such as Boxed or Full width. It is High User Friendly and highly recommended for all type of webmasters such as you can use it on any kind of topic like Tips and Tricks, Android Tips, Computer Tricks, Internet, News, Information technology News, Software and Games etc. it suits with every niche you like. It is build with simple light weight coding that does not hurt SEO ranking of your site, Its design simple, clean that is perfect for portfolio or also for personal websites. It comes With an attractive color combination which surely impressed professionals and has many other premium qualities.